“Jolly Good” holidays to you and yours! Super excited about this show. The excellent-cool folks at the Bluebottle Art Gallery & Store in my favorite-not-home-city, Seattle, WA are putting on a fantastic holiday art print show called “Jolly Good” which features the work of over 30 screenprint artists from all over the US. And best, they invited me to join in the fun. Yes huh! 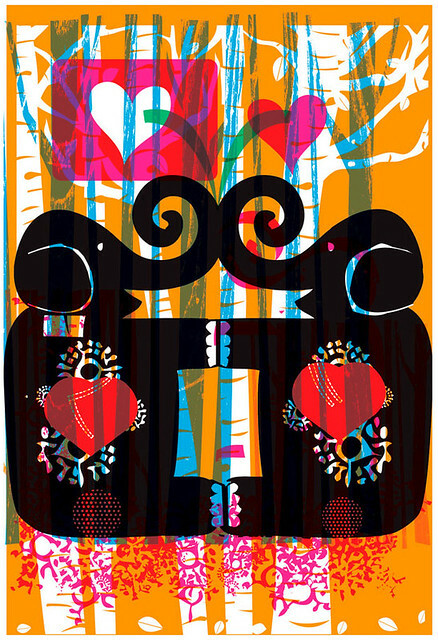 The “Jolly Good, Group art print show” will run from December 2nd, 2008 – December 31st, 2008. The opening reception for the show will be on Saturday Dec 13th from 5 – 8 pm, so please join in the fun for drinks, snacks and cheer! Blue Bottle Art Gallery & Store is located in the Capitol Hill neighborhood of Seattle at 415 East Pine Street. My newest, fresh off the presses art print “Winter 2008″ will be available making it’s debut at this show and will be available for view and purchase, yep. Other participating artists include Cricket Press, Tad Carpenter, Nate Duval & a slew of others that make up the 30+ artists. 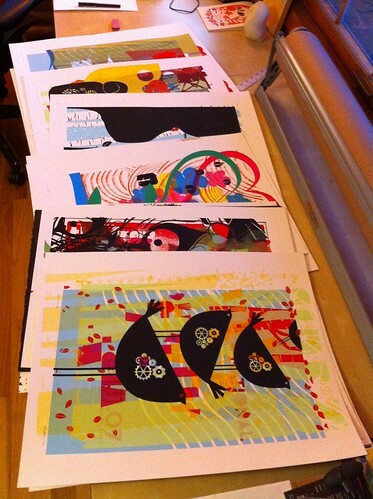 The artists have entered 2 -5 prints into the show and all prints will be available for purchase. I’m sending 5, wassssup?! 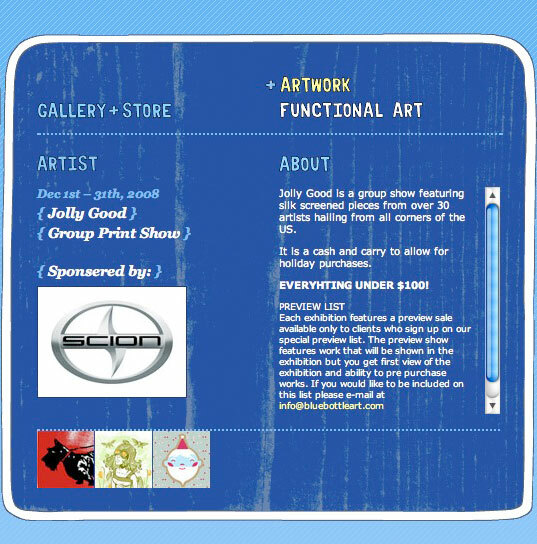 Please note that as “Jolly Good” is designed to be a cash and carry show, to allow for holiday purchases, prints will be going fast while the show is up. 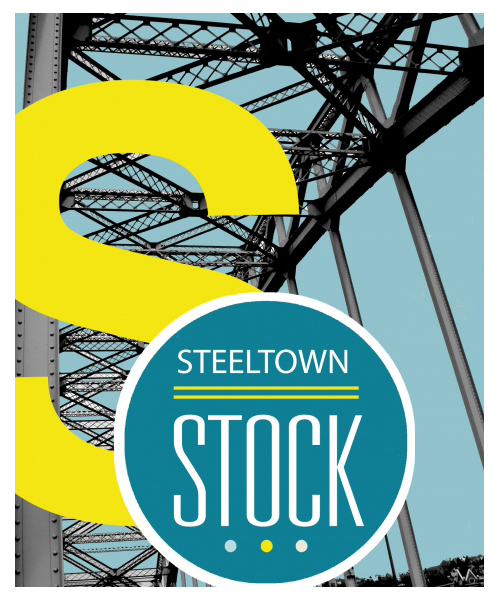 All art prints are priced under $100, many in the $25 – $50 range. 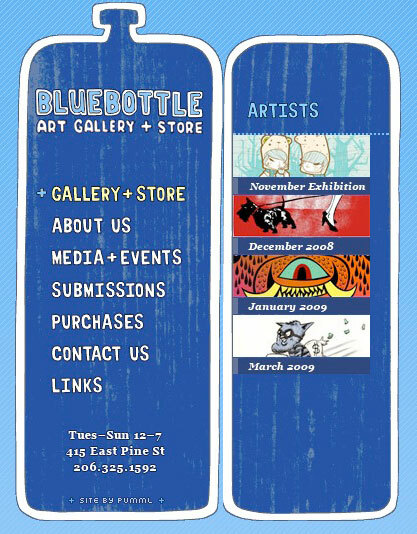 Bluebottle Art Gallery & Store also runs an email preview list that you can sign up for here, which allows you to get sneak previews of art work before the general public. It’s a cool gig! Bluebottle Art Gallery & Store is an independently owned & operated art gallery and curated boutique shop of handmade goods run by the lovely husband & wife team of Andrea & Matthew Porter. We’re tickled holiday red to be a part of this show. Cheers!